Today, local Salvation Army officers, staff and volunteers will continue to assist residents, first-responders and clean-up crews in Hollister’s hard-hit Turkey Creek area. “We arrived on the scene within the hour with water, a few clean-up kits, personnel and snacks, Lt. Shawn DeBaar, Branson Corps Officer and Incident Commander, said. The Salvation Army will provide immediate assistance to those in need from its Emergency Disaster Services mobile canteen. The EDS canteen will provide meals, snacks, drinks, and disaster clean-up supplies. “It has been estimated that the number of people being served through this mobile canteen site will be around seventy,” DeBaar said. The Salvation Army is also the lead agency in charge of serving daily meals at Hollister’s Red Cross shelter. The shelter is located at the New Beginning’s Fellowship Church – 151 Elm St. On Monday, The Salvation Army served seventy-five meals from the shelter. “We have committed to feed those in the Red Cross shelter as long as the shelter is operating,” DeBaar said. Currently needed in-kind donations include bottled water, sports drinks (e.g Powerade, Gatorade, etc. ), clean-up supplies and first aid kits. All donations may be delivered to The Salvation Army’s Branson Corps – 114 Stanley Blvd. For more information please contact The Salvation Army’s Branson Corps at (417) 339-4434. Help provide immediate assistance by donating here, calling 1-800-SAL-ARMY, or by mailing checks to The Salvation Army, P.O. Box 1715 Branson MO 65615-1715. Two years ago in our division, we saw one of the worst disasters Missouri had ever seen. We all know about the devastation that occurred in Joplin in 2011; the EF-5 tornado that left miles of destruction and families and neighbors who had lost their lives from the impact. 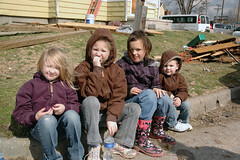 And to this day, they are still working to rebuild their city with the help of The Salvation Army. During this time when families pulled their loved ones out of the rubble, our neighbor to the southwest–the great state of Oklahoma–came to the aid of Joplin and brought supplies, volunteers, and emotional support. So when Moore, Okla. was hit with an EF-5 tornado two days before the two year anniversary of Joplin, there was no question that we needed to support our neighbors. The Salvation Army’s Joplin Corps Community Center immediately started taking up a collection of supplies to give to those – who just like them – lost everything. Joplin Corps officers Lt. James and Jamie Curry spearheaded the effort and the supplies were taken to Oklahoma. We are proud to show you the supplies that the Joplin community collected to send to Oklahoma, and we are so proud to give back to those who gave so much to us two years ago. I was out both Saturday and Sunday working with The Salvation Army’s mobile canteens that were deployed to St. Charles County and St. Louis’ North County that were hit by tornadoes Friday night. I had the privilege to speak with several residents who were affected by the severe weather. You would think if your roof was gone or if the back of your house had been ripped off, you would be pretty mad. But the primary sentiment I heard while touring these places was gratitude. Even when there’s a tree laying on their roof, the citizens of St. Louis and St. Charles have been nothing but grateful for the droves of neighbors, friends, and organizations who have donated their time to help. So it’s up to us to make sure that they can recover from the damage that Mother Nature has given them. If you are an EDS trained volunteer, we are still working in the neighborhoods affected, so please contact gary_busiek@usc.salvationarmy.org to sign up to volunteer in our canteens. If you have not been through our EDS training, we ask that you refrain from contacting to volunteer at this time, unless it is to sign up for a future training. If you are interested in receiving training, please call 314-646-3000 and ask for our EDS department. If you are looking for ways to help, the best thing you can do is donate money. As more specific needs arise, we want to ensure that the families affected do not need to go through red tape to get what they need, and your dollars give us the flexibility to support these residents immediately. Please give now to be a part of the recovery. To keep up to date with our efforts, follow us on Twitter or Facebook or sign up to be on our email list. To view photographs from our canteen tours, visit our Flickr Page. When disasters hit, our volunteers will be there to greet you with a smile. Serving more than 200,000 meals, drinks, and snacks each year, The Salvation Army’s canteens are a beacon of hope to those affected by severe storms, tornados, and other disasters. The hope of these canteens came from a different sort of beacon this week as Beacon Roofing Supply, Inc. donated $100,000 to help replace canteens in St. Louis, Cape Girardeau, and Joplin. The United Way of Greater St. Louis also donated $50,000 towards the replacement of these canteens. Representatives from Joplin, The Salvation Army, United Way, and Beacon Roofing attended a dedication service at the Midland Division Headquarters on January 28th to celebrate the new canteens. St. Louis Fire Department Chief Dennis Jenkerson, Advisory Board Chairman Mark Abels, and Divisional Commander Major Lonneal Richardson were also on-hand to highlight the work of the canteens. Responding to more than 90,000 calls every year, the St. Louis Fire Department is always grateful to see a canteen at a disaster site. The canteens aren’t just utilized during times of disaster, though. Regularly used to provide meals, water, and clothing to St. Louis’ homeless community, the canteens are and will now continue to be a vital part of The Salvation Army’s mission of Doing the Most Good. The Salvation Army is continuing to monitor and prepare for Hurricane Sandy as it makes its way up the eastern seaboard with potentially devastating impacts to millions of people. There are more than 300 emergency response vehicles in the eastern and southern United States alone and more than 600 units nationwide, capable of serving thousands of meals and drinks per day. In response to a request from the Wicomico County Emergency Management, The Salvation Army of Salisbury served lunch for more than 200 persons at the shelter on Sunday. The Salvation Army is assisting with sheltering activities at Salisbury Bennett High School in a community where residents have been asked to evacuate. In Annapolis, The Salvation Army is serving meals at Annapolis High School, where an emergency shelter opened Saturday evening and will continue to do so until that shelter closes. The Salvation Army in Baltimore is in close contact with the Baltimore City & County Emergency Operations Centers and has been asked to feed neighborhoods that lose power should the need arise. All Salvation Army units across the Commonwealth and District are on stand-by status. Mobile feeding kitchens are stocked, and Salvation Army officers and volunteers are ready to deploy as needed and requested by Emergency Management personnel. On Saturday evening, The Salvation Army Men’s Hope Center Shelter in Norfolk, VA sheltered 60 people. In coordination with the Office to End Homelessness, the Men’s Hope Center is prepared to transport to area city shelters if asked to evacuate due to potential flooding. The New Jersey Division currently has its full fleet of emergency response vehicles ready to deploy if needed. This includes 10 fully-stocked canteens, two service vehicles, and one mobile command unit. Atlantic County has requested The Salvation Army provide feeding at its operating shelters. The Salvation Army Red Bank Corps will receive evacuated nursing home patients on Sunday and Monday. For further information, please visit our Emergency Disaster Services page at Disaster.SalvationArmyUSA.org, and check our Facebook and Twitter pages for continued updates. At this point, in-kind donations are not being accepted for hurricane relief. However, these gifts are vitally important in supporting the day-to-day work of your local Salvation Army. Please consider giving these items to your local Salvation Army Family Store or dial 1-800-SA-TRUCK (1-800-728-7825). We will keep you posted as the storm progresses. Thanks for your help. Scott and Dan are more than just coworkers – they are best friends. As volunteer maintenance workers for The Salvation Army-Harbor Light Center this dynamic duo always is on the move. They do just about everything from plumbing, electrical work, painting, organizing warehouses, fixing trucks and trailers, and disaster relief – always performing these tasks as a partnership. Both men began their volunteering journey with The Salvation Army by performing construction at the Harbor Light Center. Realizing the poor condition of this location, their hearts were moved to help all St. Louis-area Salvation Army locations in any way possible. They have been working as an unstoppable team ever since. Their previous projects include fixing up a playground at the Temple Corps, picking up supplies Boy Scouts collected, fixing up the Emergency Disaster Services warehouse where all the disaster relief supplies are stored, fixing up the social services warehouse where furniture for The Salvation Army is stored, among a myriad of others. Scott (pictured left) and Dan (pictured right) saw what unfortunate condition these warehouses previously were in, so say they knew there was no other choice but to reorganize them. In fact, upon arrival at the Emergency Disaster Services warehouse, Scott sat down and immediately wrote a list of everything that needed to be fixed. His list grew to six pages. Following Scott’s new guidelines, every last box and machine was taken out of the warehouse, supplies were sorted through and the warehouse was reorganized in only two weeks, showing his passionate dedication. “When we get on a job site, we don’t waste time,” says Dan proudly. Scott and Dan’s biggest undertakings have been disaster relief projects. This unparalleled duo has helped after the tornado of New Year’s 2011, the Good Friday tornado of 2011, the Harrisburg tornadoes and the Joplin tornadoes. These two have had countless opportunities to touch lives. “…Cleaning front yards from tornados, it’s simple stuff that really touched people,” explains Dan. But both Scott and Dan realize while this work is rewarding, it is challenging as well. “I’ve seen a lot of hurt people,” says Dan as he continues to briefly tell a story about a man in Joplin who didn’t even know his house had been hit by the tornado until he saw The Salvation Army volunteers working on his broken home. They have definitely seen it all. Dan also explains about a tree that had been picked up by a tornado and planted back down, smack dab in the middle of someone’s house. “It looked like a flower pot!” says Dan with a hearty laugh. There is nothing they can’t tackle as long as they are together. While it might be difficult to take a step back and let others join in when you are as talented as these two, Dan sums up the most rewarding part of volunteering for The Salvation Army in a few words. “Getting away from yourself,” he says as Scott silently nods in approval with a solemn smile on his face. In addition to being a volunteer maintenance man, Scott has been pursuing his Ph.D. and heading a research project to cure sepsis. Scott previously served in the Army for 34 years, starting in Vietnam and finishing in Afghanistan. He worked as a special forces medic for the last 31 years of his army career. Since his army days, he has received a Masters degree in microbiology and a Masters degree in public health. Currently, he teaches graduate students at Washington University Medical School while working toward his Ph.D. and continuing his research. In the fall, he will begin teaching full time and will receive his Ph.D. in December. “At his age, what else has he got to do? !” Dan jokes with him. All jokes aside, however, these men inspire people with their big actions and even bigger hearts. This couldn’t be a more true testimony, as these two are a one-of-a-kind pair. People might hesitate separating them if they want a job done right. They have been working together for only two-and-a-half years and they are already finishing each other’s sentences, helping each other remember details when recalling past projects and laughing about inside jokes. It’s apparent they like their job best if they can work together. They work as a team to improve the shelters so the shelters can improve the lives of the homeless. Their impressive skill level allows them to be useful throughout The Salvation Army’s Midland Division. To put it simply, they can truly go anywhere and do anything. These two absolutely love what they do and they are moved by God every day to fulfill His work. In the midst of the recovery efforts in Harrisburg, Ill, a group of motorcycle men and women came wheeling into the Harrisburg Thrift Store parking lot ready to give back to this hurting community. Not just any motor club, but one with a mission in line with The Salvation Army, with their colors being red, yellow and blue, called, “Soldiers of Truth in God’s Army.” On the outside they looked just any other motorcycle club, but their inner calling and spiritual mission is to reach the lost for Jesus Christ through worship to God and service to society. This Motorcycle Ministry set them apart from all the others clubs I have ever seen. I quickly came to understand that they indeed been commissioned by God to do His work whenever and wherever needed. Harrisburg, Ill was their next stop to share the gospel of Jesus Christ with a hand to man and heart to God. I must say I was moved to see them in action, not just clearing out a trailer full of clothes and household items, but their actions were God-driven and Christ-like. My eyes were opened in different way and my spirit connected to them. No questions were asked beyond “What can we do to help The Salvation Army help the Harrisburg victim’s?” This is just the type of servant-leadership that is so desperately needed during disasters. This group offered themselves as sacrificial servants ready to give to others wholeheartedly. Their actions scaled my attention to the Bible verse in Romans 12:1, which says, “I beseech you therefore, brethren, by the mercies of God, that ye present your bodies a living sacrifice, holy, acceptable unto God, which is your reasonable service.” Their hands and hearts became those of Jesus Christ through the faithful service. They revealed to me that we must honor others above ourselves with compassionate and serviceable affection to those undergoing a catastrophes event. This motorcycle ministry, Soldiers of God’s Truth, has some shady past with drug abuse at the top of the list, but they are like me and you, sinners saved by the grace of God. “We are hard pressed on every side, yet not crushed; we are perplexed, but not in despair; persecuted; but not forsaken; struck down, but not destroyed.” II Corinthians 4:8. Although they have been knocked down by the world and sin, like all of us, in Christ, they are not knocked out. We serve a God of second chances, who will not give up on us, but who loves us during this journey of life here on earth. Even during times of hardship and humiliation, God loves us all. These Soldiers of Truth in God’s Army renewed my hope in the Lord. As I fellowshipped and served with them that sunny Saturday afternoon, God revealed Himself through this Motorcycle Ministry. I then taught them the song which says, “We are soldiers in the army; we have to fight although we have to die; we have to hold up the blood stained banner, we have to hold it until we die.” This battle cry became our united theme of service. I am sure God smiled, or even laughed at us as we sang that song in the parking lot of the Harrisburg, Ill Thrift Store. These motorcycle soldiers not only ride for righteousness, but they are a church as well, called “Warehouse of Worship.” According to the pastor and the other Christ Riders, they worship Jesus in spirit and in TRUTH through service to others, the gospel of Jesus is preached and part of their daily lifestyle. They not only read the Bible as their manual for Christly living, but they worship together to bring glory to God as a community of believers. I was very much honored to be in their presence and although I was not a Christly bike rider, we worship the same savior Jesus Christ. It also helped that we share the same colors, red, yellow and blue, in addition to being SOLDIERS. Clark & Washington Counties, IN—The Salvation Army has finished its first full day of operations in response to yesterday’s deadly tornadoes. In Henryville, the Army is serving 800 meals a day to survivors and emergency personnel. It was an emotional day for residents as they got their first clear view of the destruction in their town. “It’s gone. Everything is gone,” one woman said through tears as she walked by The Salvation Army canteen. She and others were comforted by Major Steve Kiger and other trained disaster service personnel from The Salvation Army. Feeding operations in Henryville will continue tomorrow. The small town of Marysville, IN was nearly completely destroyed by the massive tornadoes. The Army will begin full meal service there tomorrow and will be prepared to serve 600 meals. The Army will also continue to serve meals at the New Pekin, IN Command Center. Today, nearly 600 meals were served to survivors and workers there. Many area businesses and organizations have made generous contributions to the Army’s food service. Among them: Wick’s Pizza, Texas Road House, Jaycee Foods, Midwest Food Bank, McDonald’s and Silver Creek High School. The Salvation Army would like thank these businesses for serving their neighbors in need. Alexandria, Virginia (March 3, 2012) – The Salvation Army continues to provide aid to impacted areas of the Midwest and Southern United States following a historic day that produced more tornadoes than in all of March in past years. Salvation Army Emergency Disaster Services (EDS) teams are also on standby to respond to severe weather and tornado watches and warnings that are still in effect in much of the region. Following the most recent wave of devastating tornadoes, EDS personnel in Tennessee are actively serving residents of several counties affected by the storms, providing spiritual and emotional care to disaster survivors as well as food and beverages, and units are on standby throughout the state ready to respond as needed,. In Chattanooga, Tenn., more than 200 meals were served at the evacuee center, and The Salvation Army of Cleveland, Tenn., served as a shelter for those seeking refuge from the storms. Salvation Army units in Decatur, Florence and Huntsville are also responding to tornado touchdowns in Limestone and Madison Counties in North Alabama. In Athens, Ala., two mobile feeding units from Decatur and Florence have responded with food and drinks, and in Meridianville, Ala., a mobile feeding unit from Huntsville has been deployed to provide food and drinks as well as spiritual and emotional care. The Salvation Army’s Emergency Disaster Services Warehouse and Command Center in Jackson, Miss. is being utilized to manage the widespread response across Alabama and Mississippi, and additional units from Alabama, Louisiana and Mississippi are also on standby for severe weather response across the mid-South. 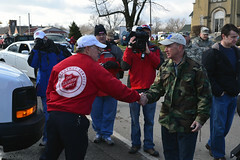 In addition, Salvation Army EDS teams from New Albany, Ind., were deployed following several powerful tornadoes in the Southern Indiana region. The Salvation Army has provided food for hundreds of disaster survivors and emergency responders, and personnel are continuing to assess what is needed to provide the best support. A team of Salvation Army social workers in Harveyville, Kan. have begun to provide aid to tornado survivors to help with immediate needs such as food, clothing, medicine, shelter, bedding and baby products. Salvation Army EDS teams have also provided meals, snacks and drinks to nearly 2,000 people in the area, and will continue to operate mass feeding operations throughout the weekend. The Salvation Army also continues to provide needed assistance to those in the Branson, MO that were affected by Wednesday’s damaging storms. Hundreds of meals have been distributed through The Salvation Army’s mobile feeding unit, and emotional and spiritual counseling is available to those in need. Your donations of funds make the biggest impact: Due to emergency conditions, The Salvation Army cannot guarantee that gifts of household goods or clothing donated now will be sent to disaster areas. In times of disaster, we fulfill household needs from existing, pre-sorted stock. Please, continue to donate gently-used household goods to your local Salvation Army—you help your community today and may help with disaster relief needs tomorrow. To find your nearest drop-off location, please go to http://www.satruck.org. * A one‐time donation of $10 will be billed to your mobile phone bill. Messaging & data rates may apply. Donations are collected for The Salvation Army by mobilecause.com. Reply STOP to 80888 to stop. Reply HELP to 80888 for help. For terms, see http://www.igfn.org/t.